This isn’t Bach's counterpoint or the musical equivalent of brain surgery. In this course, your team will learn easy-to-apply concepts and tools that will help them create a killer arrangement of any song, no matter what size your band. Your team will learn the skills to "arrangement hack”—that is, to create a great sounding arrangement similar to recording, without the pressure to duplicate it perfectly. Your team will play tighter and more together because they’ve learned how to self-arrange, how to complement each other, and really listen to each other. Get your sound techs and musicians on the same page so the tech knows how to mix the arrangement, and the band gives the tech something worth mixing. Make song arrangements your own. You'll learn how to arrange in a way that musically fits your team, your church, and the culture in which you're serving. Create collaboration & healthy musical dialog among your team members. This course will help them understand musical teamwork like never before. This class is a ready-made resource to train up new musical directors and band leaders. This course is done-for-you training. 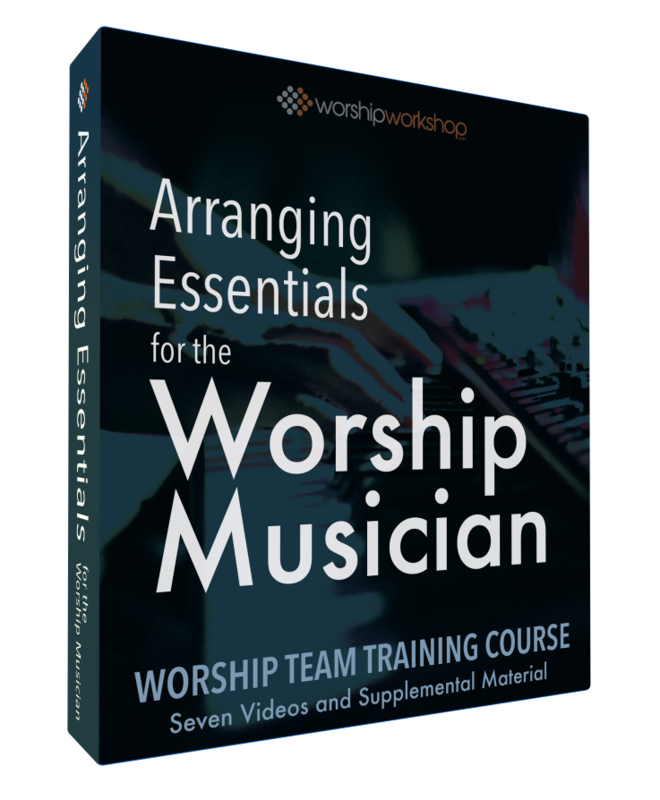 Seven on-demand videos will help your team journey towards a better sounding band to accompany worship. For information to become transformation, there needs to be CONVERSATION. The Leader's Guide has questions to help your team process and discuss the training. These printable or digital handouts will help your team engaged during the training AND be easy to reference and review long after the training is completed. There's nothing like, "There will be a quiz on this" to help create accountability with team. Don't worry—it's not tough. But it does require they watch the training. Buying a training course is easy. Actually using that course to transform your team is TOUGH. That's why we've included implementation tips and strategies for leaders. Why do you want the slide deck? There are key principles in this course that you'll want to revisit with your team over and over. You can use the slide graphics to easily teach and remind your team. Too many times, worship musicians unintentionally create a blob of sound. Certain instruments step all over each other and create muddy messes in the mid- and low-range. This will teach your team how to arrange themselves out of that. Rhythmically, instruments often compete with each other AND the melody. They’re just too busy. This class will teach your team how to create space, but still give the song the energy it needs. Copying the arrangement of a professionally produced recording is all but impossible. So your team will learn how and when to duplicate the parts on the recording, and how and when they should make up their own parts. In this class, your team will learn the 3 Gs of Arrangement Hacking. They’ll be able to listen to a recording and determine what parts are there and what’s needed as they come up with their own arrangement of the song. We dive into 11 “rules" that helps bring more focus and clarity to what each instrumentalist should (and shouldn’t) be doing. We take these arranging principles and apply them for the vocalists. They’ll learn 12 rules to help them understand when to sing, what to sing, how to sing, and when NOT to sing. A full and complete training—not a teaser product. The same exact training we use inside our premium training site, WorshipWorkshop.com. So why the low price? We wanted to give you a big taste of what's inside of Worship Workshop AND help you train your team at the same time. For whatever reason, if you find you don't like this course, we'll refund your money.